These vegan lasagna cuties contain no cheese, vegan or otherwise. And you won't miss it. 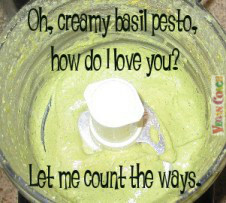 Instead we use pesto for a recipe that is rich and flavorful. Do you LOVE lasagna? I do too. It makes me drool. 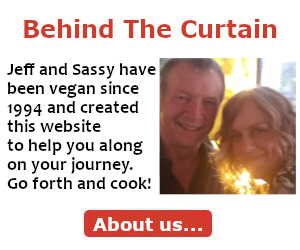 So since we're both lovers of this delectable dish, I thought you might be interested in these Vegan Lasagna Rollups stuffed with pesto, tempeh, and other goodies. These rollups are TASTY! And they're extremely simple to make too. Of course, you'll have to take a little prep time to get the ingredients ready to go. But once that's done, they take just a couple minutes to roll up -- and devour! 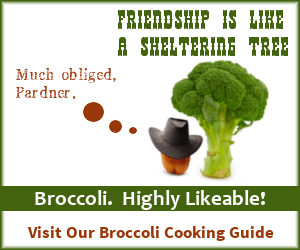 You'll also find steamed broccoli making an appearance, which adds such a beautiful bright color to this dish. 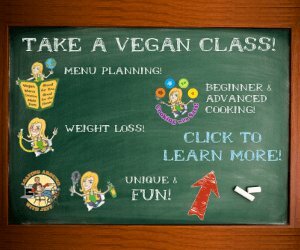 And, of course, gets some veggies inside of you. 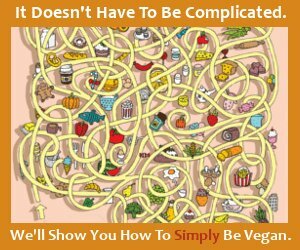 The quality of the marinara is important, so if you can't make your own then try to opt for organic marinara which is far more flavorful than non-organic. I like anything by Seeds of Change, although they CAN BE expensive. A more affordable vegan marinara that has a great taste is created by Muir Glen. It should take you about 30 minutes to create this dish. It's a little more time than I usually spend on a meal. In fact, these make a wonderful Sunday-type dinner because as with most Sunday dinners they're a teensy bit time consuming to make, but the results are so outstanding that I make the time! But none of the steps are difficult and the whole dish is quite simple to put together. 2. Cook the noodles: Boil a large pot of water. Cook noodles according to directions on package. Drain in a colander, then toss with a teeny tiny bit of oil just to keep them from sticking to each other. Place the colander over the empty pot (helps to keep the noodles slightly warmed). 3. Cook the tempeh: While waiting for the water and noodles, bring 1 cup of veggie broth to a boil in a small saucepan. Cut tempeh in half and place both fat halves in the saucepan (it's okay if they overlap). Cover, turn heat to low, and let simmer for 15 minutes. Cool slightly and grate*. 4. Warm the marinara in a saucepan and keep warm until serving. 5. Cook the broccoli: Cut the broccoli into bite-sized pieces. Lightly steam until tender. I always do this step last so the broccoli doesn't overcook -- or get cold -- while waiting. 5. 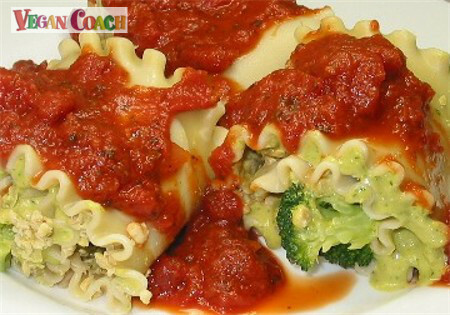 Make the Lasagna Rollups: Lay a cooked lasagna noodle out on a large plate. (I usually work with 2 at once.) Spread 2 Tablespoons of pesto across the noodle. Sprinkle grated tempeh over the pesto. Lay warm and tender broccoli across the pesto in a single line. Roll up. Cover with warm marinara and serve immediately. 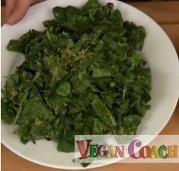 Sprinkle with nutritional yeast or vegan parmesan, if desired. 6. Serves 3; three rollups per person. Makes great leftovers and freezes beautifully. Serve with a tender Spinach Salad and some crusty garlic bread. 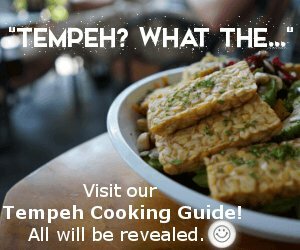 Tip: Why cool tempeh only "slightly"? Well, you definitely need to let it cool a little because hot tempeh is just too hot to handle. But when if it cools completely (as in, gets cold) it's not as easy to grate. So I like to grate my tempeh after it has cooled slightly.